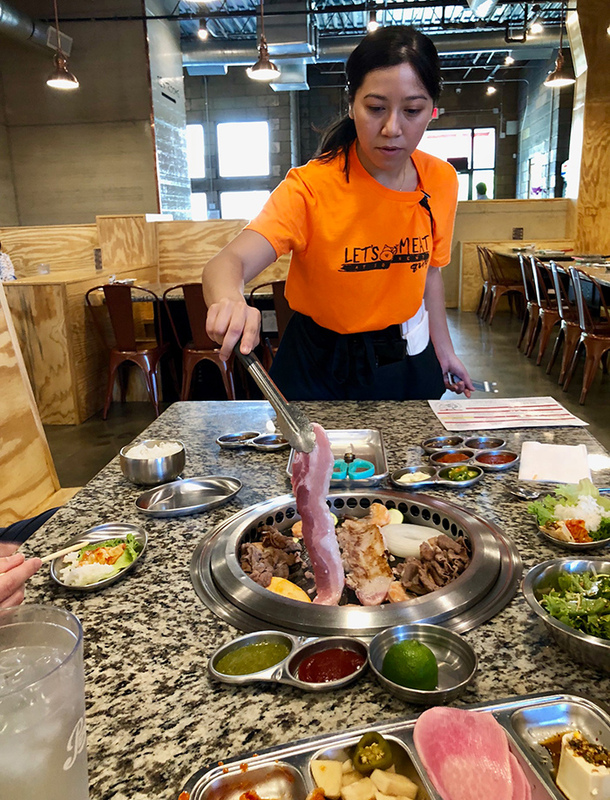 Let’s Meat, the new all-you-can-eat traditional Korean BBQ restaurant, opened this spring and is off to a hot start. 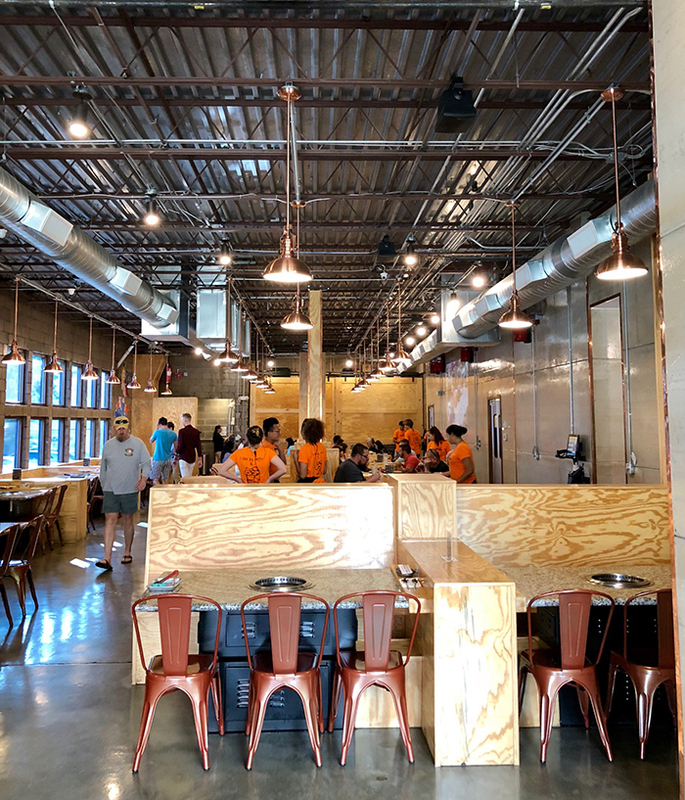 Since opening in late March, Let’s Meat has developed a reputation as a fun, tasty spot for a different type of dining experience. The South End restaurant has a 4.5/5 on Yelp, 4.9/5 on Facebook and 4.5/5 on Google. 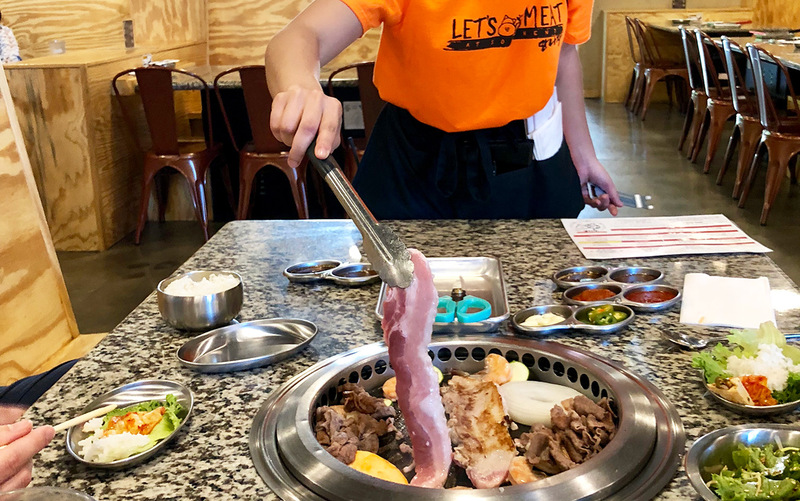 Let’s Meat is the second restaurant from husband-and-wife team Tim Chun and Lisa Kamura and is located adjacent to the couple’s first runaway hit Seoul Food Meat Company at 1400 S. Church Street. How does Let’s Meat work? The all-you-can-eat experience is a $29.99 flat rate per person ($11.99 for kids 4-10). Yes, it’s pricey. You have a two-hour limit at the table, which is plenty of time given how fast everything comes out. You’ll be seated once your entire group is there, not before. Each table has built-in burners where your meat and veggies will be cooked. 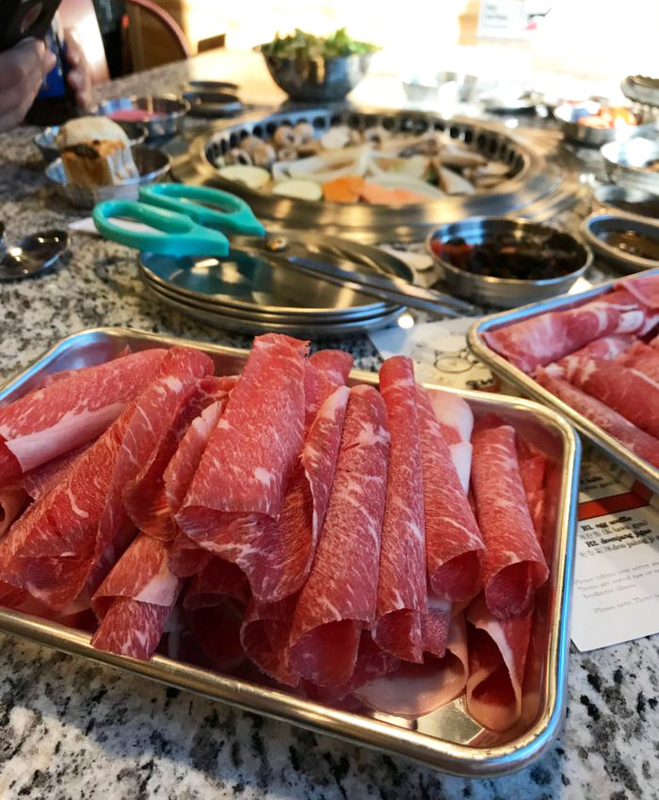 OK, here’s 8 things to know if you’re a first timer at Let’s Meat. (1) To start, your server will bring out an elaborate tray of sauces, pickles, salad and fresh toppings. 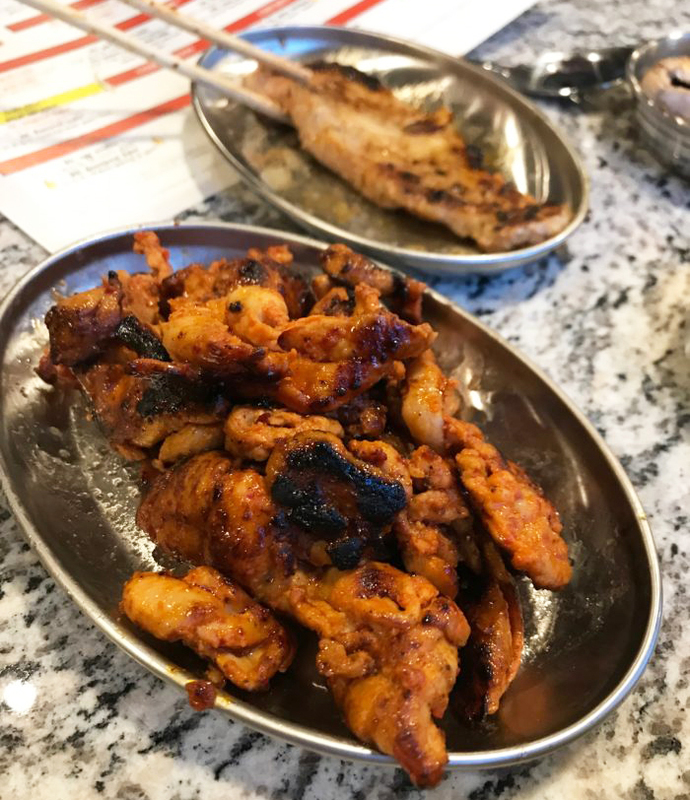 Sure, try everything on the starter tray, but don’t fill up on it — the meat is the hero of the meal. 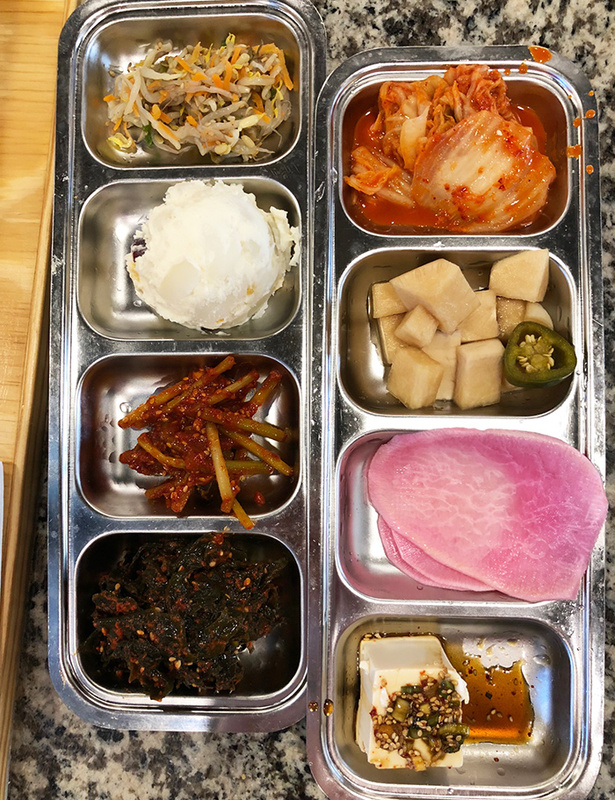 (2) Unlike its sister restaurant, Seoul Food, there are no cocktails at Let’s Meat. It’s bottle/canned beer, wine, Korean wine and soju. 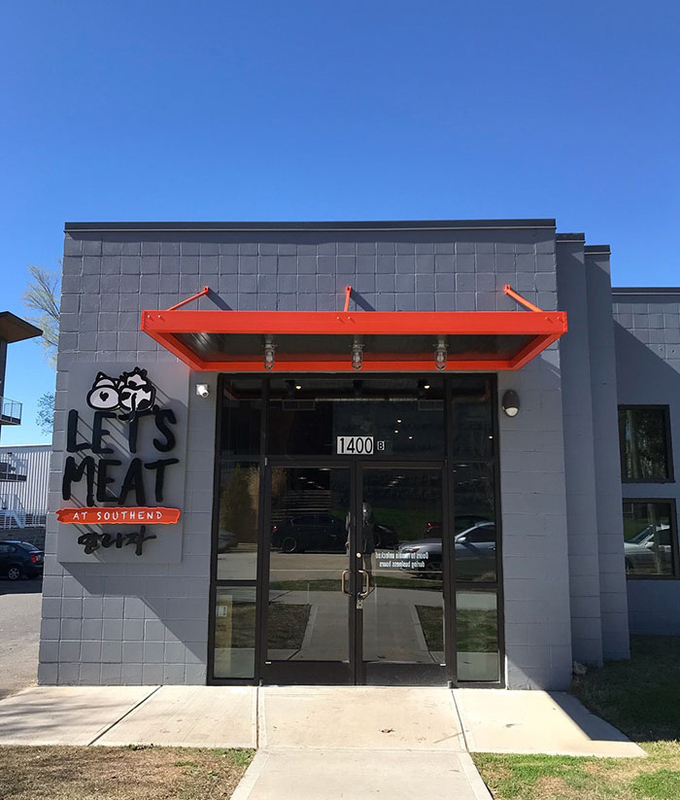 It’s definitely got a no-frills vibe and it works, but I wish Let’s Meat had group-oriented punches and cocktails to complement the group dining experience. I went with a canned NoDa Jam Session and my buddy went with an OMB Copper bottle. (3) For your first order, focus on the basics and un-marinated meats. Order the green leaf lettuce (yes, it’s literally leaves of lettuce), a rice bowl (brown or white) and a veggie tray as accompaniments. 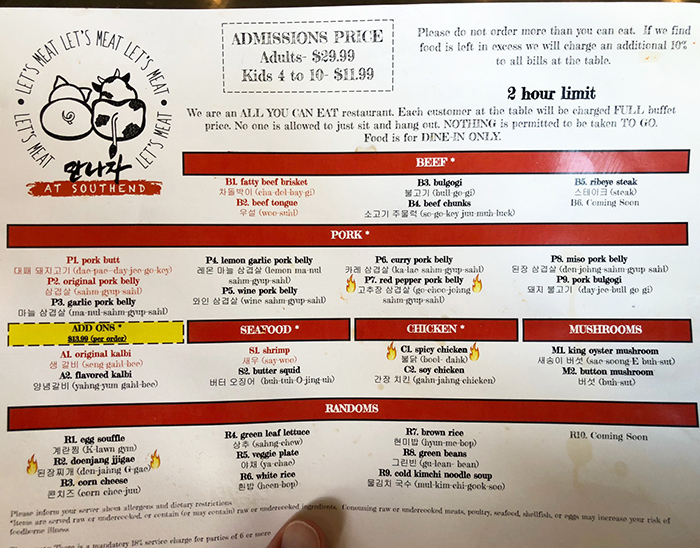 Start your meat-a-thon with un-marinated options (highlighted in red on the menu) so you don’t gunk up your grill early. In terms of un-marinated meat, go with the fatty beef brisket, original pork belly and shrimp. (4) Don’t worry about undercooking your meat — your server handles the actual cooking. I thought I would be the one to pick up the meat and put it on the grill, but my server handled everything. She gave us a heads up when stuff was done and divided the meat and veggies onto either side of the grill so that my buddy and I had specific portions. It’s like a miniature hibachi dinner. The operations were super smooth. Very impressive. (5) Yes, there are scissors on your table. Yes, they’ll be used often. 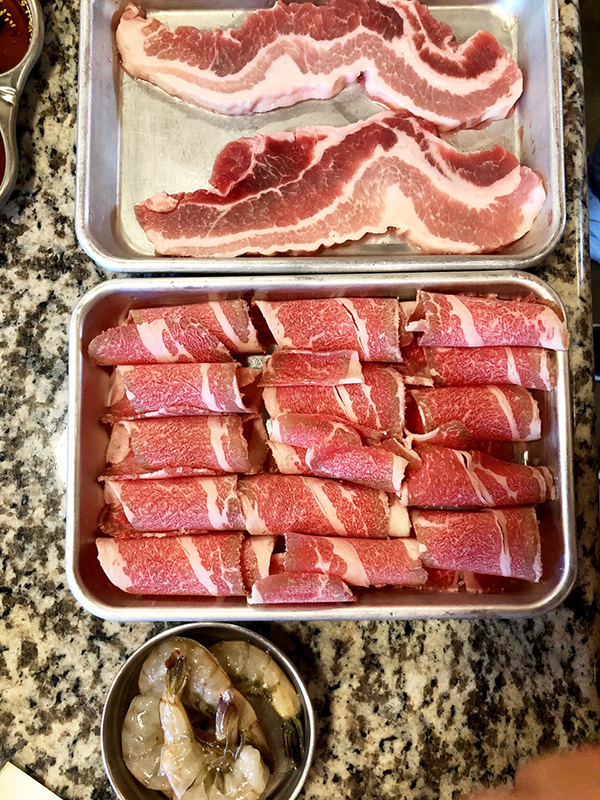 Your server will use the scissors to cut the meat, which is often in a bacon type strip, into small bites. You won’t have to do any cutting. Let’s Meat doesn’t even provide you a knife because it’s unnecessary. (6) Food comes out and cooks fast, so you can order in waves (2-5 dishes at a time). Don’t get everything all at once. Wait until you’ve freed up grill space (and confirmed you still have stomach space) before trying something else. Nobody likes the person that panics about the two-hour time limit and then is stuffed after 25 minutes. Given the speed, two hours is more than enough time to stuff your face. 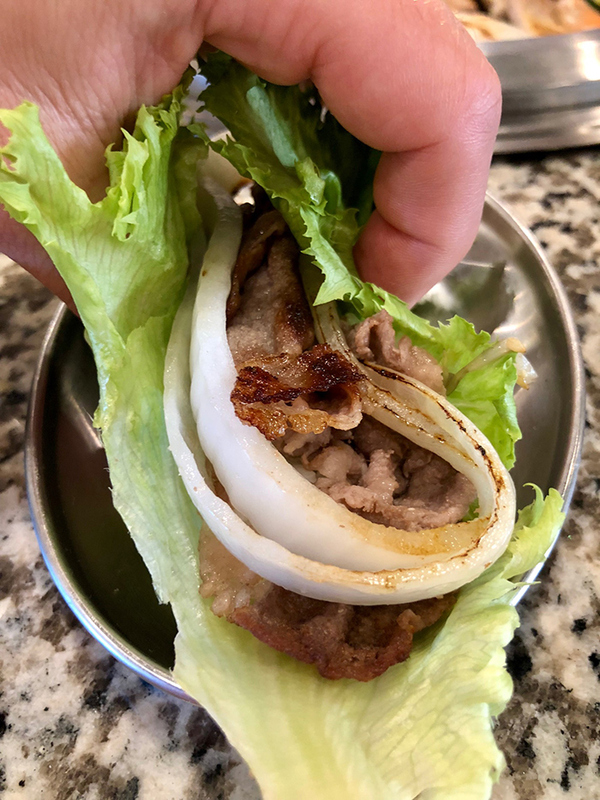 My favorite dish was the beef bulgogi. It’s a must-order. If you have room, you can order sides (called “randoms”) like potato salad, egg souffle and mixed veggies. Definitely get the corn cheese. It’s just a cup of corn and cheese you put on the grill and melt. (7) Give all the sauces a shot. 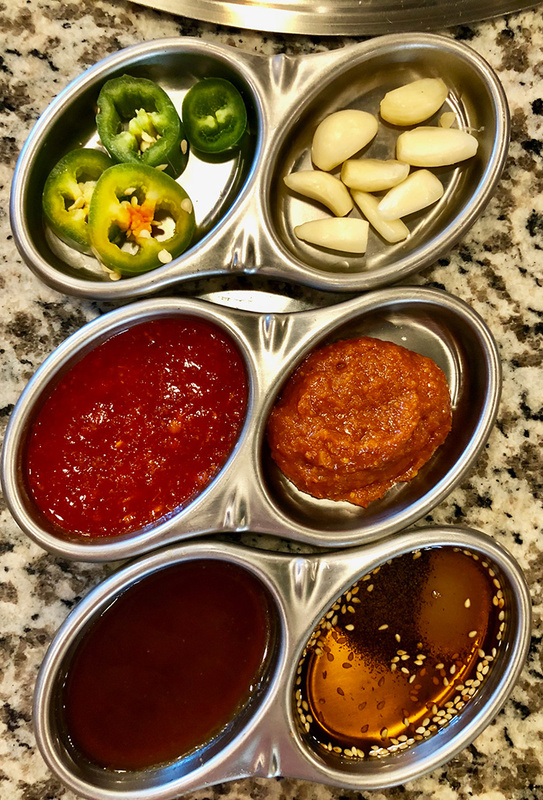 There’ll be 6 sauces for you to choose from as well as jalapeño and garlic that you can add onto the grill. My favorite sauce is the worst looking one in the photo below (bottom left). These are about 1/2 of the sauces. I should have taken a full sauce selection photo, but I blew it. (8) Embrace the meat sweats, because they’ll set in. Sure, you can order the veggies and mushrooms, but Let’s Meat is about — you guessed it — the meat. I did eat two pieces of lettuce that I used as wrappers for my meat, so that’s basically a salad right?